Its been a while since we got a well rounded adventure from the Asterix canon. With that master tale spinner Goscinny not around, Uderzo did a fabulous job at the art but not at the script. With that becoming the trend, this legendary world appeared to be doomed to be frozen. Jean-Yves Ferri, the new story teller, has resurrected this celebrated village in style. It has all the magic of the olden times, the action, adventure, and at times predictable lines, yet with enough happening. The story is also refreshing and reminds of several past adventures. there is a lot happening, and is busy just as the Gaulish village is known to be. Its comical, funny and very colorful. 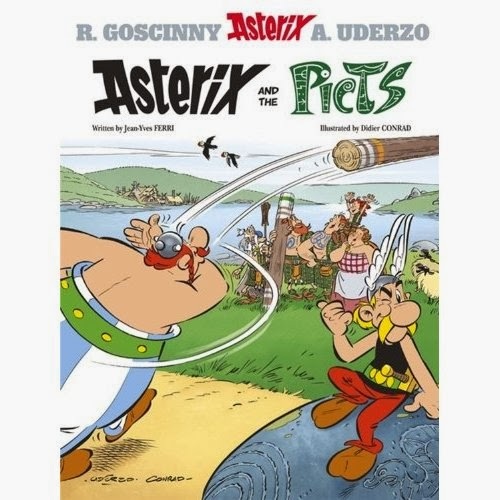 Didier Conrad, who has taken the mantle from Albert Uderzo, has brought the story to life faithfully in the Marcinelle style, that Uderzo popularized. and his style fits right in with so many things in each frame that came to define this adventure series. I enjoyed reading an Asterix after a long time, and certainly recommend this for the fans of Asterix, and also to a new generation who can get started on this and go back to the original series.